Hermit’s v London Saints at Newbury, Sunday June 25, 2017 – Sunny, warm and dry. Once in a while in the history of a cricket club there occurs an event so incredible that causes you to ask yourself: Did that really happen? It was a moment which made you glad to be there, one which, when you tell your grandchildren, they will gaze back at you, open-mouthed in disbelief. So mark Sunday June 25, 2017, in your diaries – for it was the moment when Dave Nanton offered to buy a round of drinks. The rest of this report (about some cricket match or other) obviously pales into insignificance but I will persist as it sets the scene for this momentous event. The day started for some of us shortly after 9.30am as we set off for the match between two London-based sides…in Berkshire! It could be argued that with all the petrol and diesel used (particularly Mr Scones’ 5mpg Mustang) this game alone may have contributed more to global warming than Donald Trump will during his entire tenure in the White House. 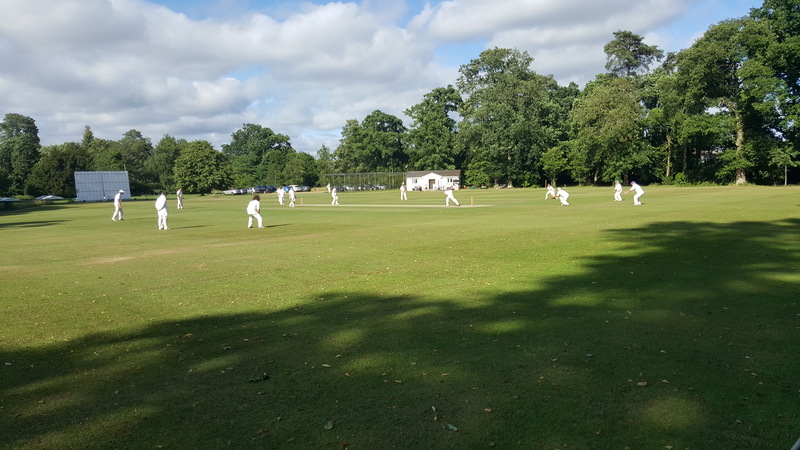 But the long trip was worth it when we arrived at the meeting point – a wonderful immaculate ground, sight screens, nets, covers, boundary ropes and a proper scoreboard hut – and best of all a former cricket pavilion-turned real ale pub with great food and Sky Sports on the telly. It was only when skipper DT turned up that we were told we were actually playing on a different pitch 200 yards down the road. So under a clear blue sky and bright sunshine, we decamped to the “other” pitch (another gallon used up by Mr Scones), in a pretty tree-lined setting. DT, with 13 London Saints players present, was able to use a squad rotation in the field. Dave duly lost the toss and Hermits, keen to avenge their defeat last year, chose to bat. The skipper opened the bowling with Phil Rogers and Dave Nanton who soon found their length and tied down the Hermits top order. Phil, impressing with some excellent swing bowling, made the first breakthrough with the Hermits score on 26 when Brook was caught behind by No2 wicketkeeper White Viv. Immediately afterwards Phil claimed Hobbs leg before, and followed that up by bowling Chamberley and Burgess. Nanton then weighed in by clean bowling Blake, who had looked in good touch. McIntyre and Berkeley then came into the bowling attack and Hilda soon dismissed Bevan, leaving Hermits reeling at 45-6. However, Wootten and Lake steadily built a kind of “strong and stable” partnership of which Theresa May can only dream. With some hefty blows the pair both raced to half-centuries as London Saints seemed once again to be grabbing defeat from the jaws of victory. One such hefty blow produced an early contender for champagne moment when John ‘Nice Pint’ Smith, fielding on the mid-on boundary, stretched every sinew, arm aloft, in a valiant attempt to catch the ball as it sailed a full 25 feet above his head. Nice try, Nice Pint! London Saints had a chance to end the pair’s charge when Wootten snicked a Paul Pearce delivery, only for No3 keeper Andy Mayhew to produce a mesmerising slow-motion tumbling/juggling act which would surely have got him to the final of Britain’s Got Talent…if only he had held on to the ball. But the move did ensure Andy’s place in the annals of the club by dropping three catches…off the same delivery. By the third attempt – amid some unkind cries of “Where’s your unicycle?” from his teammates – he had cemented his place as No15 keeper. Much to Pearcey’s annoyance, Wootten duly clobbered his next delivery to the boundary – and so it continued. The partnership was finally ended by DT, who brought himself on for a spell of his new-fangled spin courtesy of his dodgy shoulder – bowling both Wootten and Jacob in a very tight final two overs. From a very precarious 45-6 Hermits had rescued their innings to post a respectable 181-8. Both teams repaired to the posh cricket ground down the road for the tea interval (Mr Scones saving a small forest in Nicaragua by going on foot). The tea was standard fare but pleasant. We then all stumbled back up the road for the second half. White Viv and Ex-Councillor Griffiths strode out, hoping to recreate their rapid start against Nascott. But some clever fielding positions and some impressive athleticism by the younger Hermits restricted the boundaries and the runs came chiefly through “quick” ones and twos. Johnners was the first to fall, trapped plumb by a ball that stayed low. That brought wicketkeeper No20 Mayhew to the crease and the two Andy’s managed to defy all odds by not running each other out. Andy J was next to fall, to a diving catch by the Hermits keeper. Steve Grant then set about the bowlers with a timely flurry of boundaries before he became the first of Hobbs’ four victims after a quick knock of 26. But Mr Scones’ dismissal saw the balance of the game take a huge swing in favour of the Hermits. Ben Sheriff looked settled and confident before chipping a golf shot into the waiting arms of mid-on, No38 keeper Mayhew then fell to an lbw, as did last year’s batting hero Phil Rogers and skipper Thomas (duck), and they were soon followed into the pavilion by Nanton, caught behind – also for a duck. With London Saints on 109-8 the game looked lost. But Pete Berkeley, Mike McIntyre and Paul Pearce had other ideas. Mike registered some big hits, while up the other end Hilda was easing himself in to his first game of the season with some boundaries of his own. But just as we were daring to dream Mike was run out for 16 when young Hermit Jacob – who had personally saved more than 20 runs with some great fielding – shattered the stumps with a 30-yard throw. That brought Pearcey to the crease to join Pete, with Saints still needing 64 with 10 overs left. The pair kept their heads and thanks largely to some strong hitting, including 15 scored off the penultimate over, Saints found themselves needing just six to win off the final six balls. Hilda, who had raced to an heroic 34 not out, kept his cool and played a dot ball, then a four, then teased us with two dot balls before crashing the fifth delivery to the mid-on boundary to clinch an incredible win. It was an astonishing victory in a see-sawing match played in good spirits, topped off with a club record 10th wicket partnership of 68 – beating the previous record of 56 set 23 years ago in 1994. Such was the post-match euphoria that One Liner Nanton began blowing off the cobwebs on his wallet………. It could have been Dave Thomas’s look of bemusement through the shock of captaining a winning side for the first time since the Palaeolithic period. Nice Pint’s optimistic leap in a bid to catch a ball as it sailed 25ft over his head was another contender. The dreaded sight of both London Saints trigger-finger umpires – Griffiths and Mayhew – in the middle at the same time in the already tense closing overs of the Saints innings seemed a sure-fire bet, but it seemed neither wanted to walk the four miles to the railway station after the match and both kept their index fingers down. So it had to be Andy Mayhew‘s impersonation of a trainee performing seal in his now infamous triple-drop which won the day. Ordinarily, Phil Rogers would have been a shoo-in for top player accolade with seven straight overs of a consistent and mesmerising swing bowling which I had the pleasure of observing from behind the stumps. He first contained and then steadily worked through the useful Hermits top order, returning figures of 7-3-12-4. But the title must go to the undoubted match winner Pete Berkeley for his unbeaten 42 – played under pressure with a calm head and scored at a good pace, ably assisted by Paul Pearce and, in the process, the pair setting a club record 10th wicket partnership. London Saints won by one wicket with one ball to spare.